“Hi, I’m Béa Beste, an educational entrepreneur from Europe. 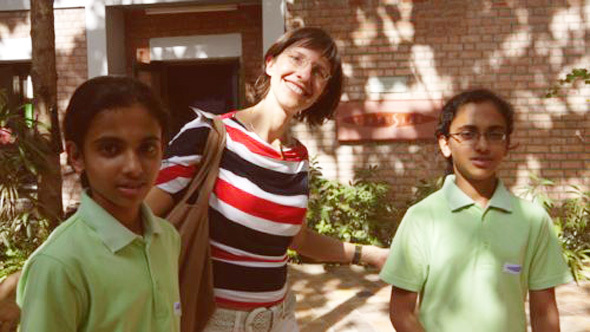 I founded and for the past six years ran bilingual schools in Germany. I’m now traveling the world to find the most innovative approaches in education… May I come visit your school and take part in the conference?” — that’s how I introduced myself to the lovely people of Riverside School. It’s all Basti’s fault: He knew Kiran Bir Sethi’s TEDtalk and then saw they’re hosting a conference on Design in Education. I was socializing with my friends in Bangalore over Romanian food but decided to attend on a whim. After fighting the odds of paying with a German credit card I managed to catch a red-eye flight to Mumbai and then transferred to Ahmedabad. My plane ran a big delay, so I rushed out of the airport and grabbed the first taxi I saw (one that Berliners would immediately put in a museum, or a hipster bar). The clueless driver had to ask several people in the streets to find Riverside (“okayokayokay ma’am!”) to finally find the street. 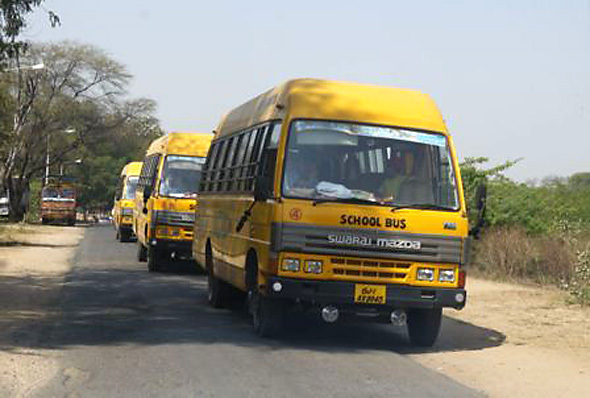 As we approached the school we saw big yellow school busses leaving, carrying the kids back home. Friday one o’clock! It’s going to be an empty school I thought. But after stepping through the shady entrance I found myself the middle of a whole flock of teachers and children. Only the youngsters left for home. Everyone else at Riverside was preparing the huge Design in Education conference with over 300 participants. And what really surprised me: They showed no signs of stress or huffiness whatsoever! The magic calmness and positivity of the place and people won my heart on the spot. Nikita, head of teacher development and in charge of organizing the conference hugged me welcome and two girls quickly appeared to show me around. Hooray! Kids acting as tour guides for visitors—that’s what do at Phorms as well. The twins Riya and Ritu had been at Riverside since first grade, but they were totally aware about how special their school is. Let me give you just a few impressions about my tour. Kiran Bir Sethi created Riverside based on a Design Thinking approach and insights into what its community needs—children and parents as well as teachers. The overall motto is “common sense”, and the Riverside attitude is remarkable. There’s a team spirit in this school based on partnership and seeing each other eye-to-eye. Children are empowered to think forward, to express themselves, and to reflect. It’s the DU attitude we’re pushing with playDUcation: a familiarity, closeness and engagement with what you learn and what you want to achieve. There is adult leadership, but not bossing around. Children and teachers are partners, working and playing together with a common purpose. They’re always asking themselves about the relationship they have to each other, creating awareness about how they feel and communicate. How do they get there? Riya: “Courage. You need to have the courage to be fully honest to yourself and others.” It’s amazing, and I saw it work. They learn by connections to real life, by participating in projects to help disabled children, to create change for the poor, to do entrepreneurial projects for the community. No aim is too high, no problem too hard not to think about a solution—and they incorporate Design Thinking when tackling problems that the kids see around them. 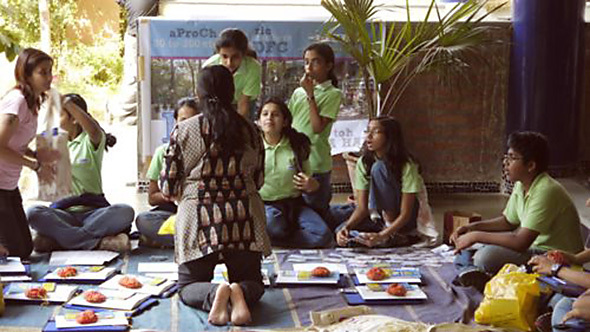 Ongoing projects undertaken within the curriculum are various – from Akshayapatra http://www.umangfoundation.org/ to aProCh http://www.aproch.org/. I loved the displays around the school! (Anyone ever noticed that the word display contains play?) They’re bright-colored, joyful and fun! Ritu and Riya constantly stopped by them and started telling their stories. 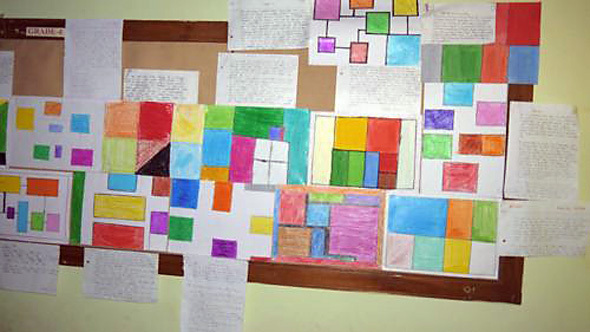 One example that you see below are pairs of pictures with simple geometric shapes. They’re the result of a game of awareness: One picture you draw yourself to symbolize your own personality. Your partner does the other one for you. Then you talk about the shapes and sizes, its colors and how much space it all takes on the page. I was amazed by how much you find out about each other! Try this when you want to give somebody feedback—or as I learned to say recently: Feed-forward! After the tour, I could just sit down in the central area of the school, under shady trees with a wireless connection to be able to check my mails. I was surrounded by the big team preparing for the conference—Kiran and the teachers meeting the speakers, kids preparing registration lists and conference bags, decorating the school—some other just following their afternoon clubs, such as soccer, karate, art or theater. The whole time I was there I couldn’t notice any discipline issues, nobody who needed to be reminded to behave or not to disturb. Smiling faces, some hug here and there, some very focused and concise briefings – I had to think about Mihaly Csikszentmihalyi’s notion of flow. It was there: The magic of this place was that everybody was tuned to what they were doing, in total peace of mind and body, with full energy and giving me the impression that what they were doing was a playful and enjoyable task, fully committed to quality and performance. This first part of the blog is dedicated to all those who contributed to Phorms in it’s very beginnings become also a magic place of well being and well doing – just to name a few just as they come to mind by being in the setting of the Riverside School and wanting them to be with me: Adele Hodgson, Wilf Stout, Celia Budge, Sabine Drexler, Rolf-Schmidt-Holtz, Alexander Olek, Christine Reuter, Johannes Nagel, Jürgen Frank, Steve Mear, Susanne Wengenmeier, Adrienne Patterson-Neifer, Richard Hengelbrok, Stephanie Jansen, Steve Mear, Rachel Walker, Klaus Steinmetz, Anita McCrorie, Nina Pape, Jonathan Walkers, Pia Weissgerber, Svenja Rosenberger, any many others).